I want to express my thanks – to you and all your colleagues – for the warm reception I received when I visited your workplace on 9/1/12 so that I could visit my beloved Teddy that I donated during an organized collection of artifacts from the Holocaust. I can’t begin to describe how emotional I was in advance of the visit and particularly how moved I was when I could hold him again and tell him what I am experiencing and to express my longing for him. At the same time, I’m delighted that my Teddy has finally found a secure and everlasting shelter. Thank you for the warm and caring attitude and I wish you and all your colleagues many contented years of work in an occupation that enables conservation and restoration of precious items from the Holocaust. Since Yad Vashem’s establishment in the early 1950’s, artifact collection has been part of the process of commemorating the destruction of European Jewry and the Jewish communities obliterated in the Holocaust. In the early years, artifacts were listed in the archives’ accession books together with the documents and photographs that were donated, and they were seen as secondary to the documents and photographs. Only in 1962 was a group of items from the archives defined as a museum collection. This included mostly artworks and a limited number of artifacts. In 1995 this collection was divided into two, forming the Art Collection and the Artifacts Collection. When Yad Vashem’s first museum came into being in 1973, the display consisted primarily of photographs and documents, in keeping with the prevailing perception that artifacts were not the focus of Yad Vashem’s collection. With the plans for the new Holocaust History Museum at Yad Vashem in the 1990’s, artifact collection underwent a fundamental change due to the new understanding of the evocative power that artifacts contribute to an awareness of the events. At this time efforts were channeled into active retrieval of artifacts. The museum staff began to attend survivor conferences, and also initiated conferences, calling for survivors to donate personal belongings to Yad Vashem’s Artifacts Collection. With the breaking down of the barriers to Eastern Europe in the early 1990’s members of the Artifacts Collection staff traveled abroad to collect artifacts from survivors in Poland, the Czech Republic, Ukraine, Belarus, Romania and elsewhere. The change in perspective brought about a considerable expansion in the number of artifacts in the collection. 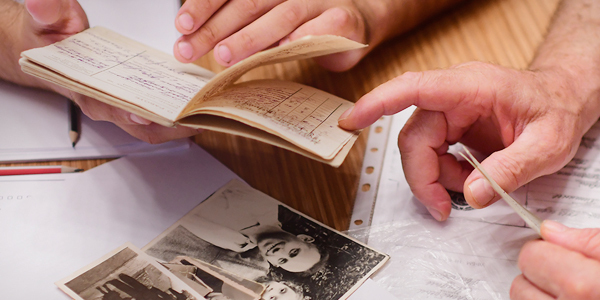 When the Holocaust History Museum opened in 2005 with over 1000 artifacts, their accompanying stories, together with documents and photographs, enhanced our ability to tell the story of the destruction of European Jewry. Following the opening of the new Museum, the Artifacts Collection team has continued to collect artifacts and their accompanying stories both in Israel and abroad. The Artifacts Department also played an active role in the “Gathering the Fragments” project that began in 2011, in the course of which a large number of artifacts were collected in a short period of time. The Artifacts Department continues in its efforts to collect and preserve artifacts, and to document the stories of the survivors and of those who perished.